Myanmar Border Guard Police officers stand guard at a village street in northern Buthidaung township, Rakhine state, Myanmar, July 13, 2017 (AP photo by Esther Htusan). 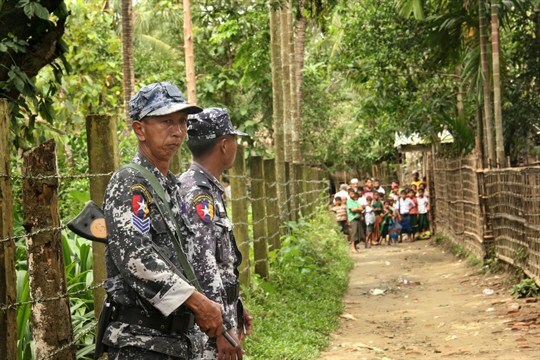 Intense fighting has returned to western Myanmar’s troubled Rakhine state, this time between the military and the Arakan Army, a well-armed ethnic group that advocates self-governance for the region. At least 26 people have died since fighting erupted in December, and thousands of civilians have been displaced, according to the United Nations. The renewed conflict is likely to further complicate the already difficult process of repatriating hundreds of thousands of Rohingya Muslims living in refugee camps across the border, in Bangladesh. In an interview with WPR, David Scott Mathieson, an independent analyst based in Yangon, Myanmar, discusses the Arakan Army’s recent evolution and explains how the fighting in Rakhine could affect the state’s battered Rohingya community.